I'm thinking Anthony 'NotFolding' Goldfinch is pretty happy to be staked and mentored by Badbeat.com this week. He started the week by winning the 10K GTD Rebuy on Royal Vegas Sunday night, beating 185 other runners for a well deserved 3000 Euros. And then he won the 3K GTD on Poker Encore Tuesday night. As a sponsored player, Goldfinch has received extensive training from Badbeat’s mentors and his game shows significant improvement after just three months under their guidance. Goldfinch’s Badbeat.com poker mentor, Peter Hedlund, recognised Anthony’s potential from the start. "When I started mentoring Anthony it was pretty obvious to me that he was a solid, winning player - but with pretty noticeable leaks and some poor results that didn't reflect his skill level,” said Hedlund. “During our mentoring sessions we've had very interesting theoretical discussions. That's one of the things that Badbeat can really provide - a deep, analytical environment for poker players that wish to be just a little bit better than the rest." Badbeat.com, the original and leading poker staking site, has been sponsoring and mentoring promising players since 2005. This summer it made its revolutionary new MyGame poker training system, modeled on that experience, available free to anyone that’s ready to step up their game. 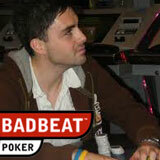 You don't have to be sponsored by Badbeat.com to benefit from their training. Their free MyGame system is designed for anyone that wants to learn, win and transform the way they play poker. It builds players’ poker skills from the ground up by analysing actual play. Access to Badbeat’s tutorials, the unique poker hands analysis tool, Report Cards, and Social gaming features are all free after registering a new account with any of Badbeat’s partner poker sites. Badbeat.com is giving away $50 Free to the first 100 players to create a new account on one of their affiliate sites such as BetfairPoker, GentingPoker, PokerTime, and Royal Vegas. Players can claim their $50 by emailing staking@badbeat.com with their site and alias.